First Presbyterian Church is delivering Thanksgiving meals to home-bound Fayette County residents. The children of the church, in front: Lucy Abbott, Simon Mitchell, Gracie Armintrout, Hannah Rohr, Hannah Preston, Henry Marshall, Remington Butcher, and in back: Tommy Garrison, Kahlen Jones, Ethan Garrison, Matticks Hernandez, Taylor Booth, Kaylee, Simone Elkins and Christy Butcher. For the 10th year, the First Presbyterian Church congregation will prepare a hot Thanksgiving meal for home-bound Fayette County residents on Thursday, Nov. 22. The meal, consisting of turkey, dressing, mashed potatoes, gravy, green beans, cranberry salad and dessert, will be delivered by church members and friends before noon on Thanksgiving Day. Residents who are enrolled in a home meal program will be receiving information about the Thanksgiving meal and an opportunity to schedule a delivery. All area churches have received a letter offering the meals to any shut-in whom they may know. Anyone may call the church office to request a meal for a home-bound person who would like a meal on Thanksgiving. This meal is part of First Presbyterian’s ongoing food ministry programs to uplift community residents, “showing them the unconditional love of Jesus by sharing resources.” First Presbyterian is fortunate to have many community partners who help with a food ministry of sharing resources and distributing abundance, according to church officials. If you know of a home-bound person who would like a meal on Thanksgiving Day, please call the church office at 740-335-2067 with the recipient’s name, address and a contact telephone number by this Friday. https://www.recordherald.com/wp-content/uploads/sites/27/2018/11/web1_20181028_111026-1.jpgFirst Presbyterian Church is delivering Thanksgiving meals to home-bound Fayette County residents. 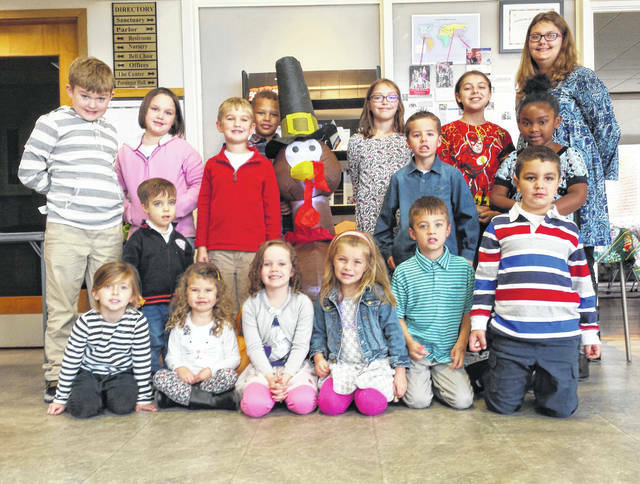 The children of the church, in front: Lucy Abbott, Simon Mitchell, Gracie Armintrout, Hannah Rohr, Hannah Preston, Henry Marshall, Remington Butcher, and in back: Tommy Garrison, Kahlen Jones, Ethan Garrison, Matticks Hernandez, Taylor Booth, Kaylee, Simone Elkins and Christy Butcher.